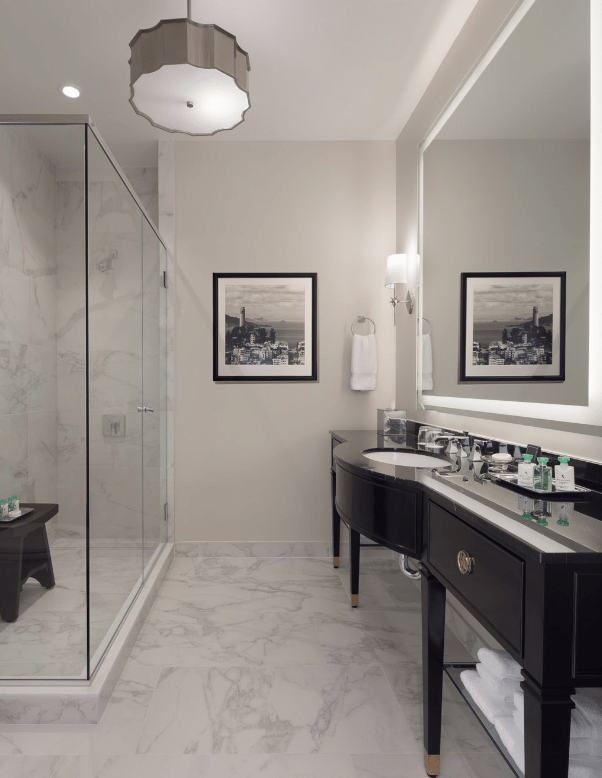 Do you dream of a luxury master bathroom in your home? 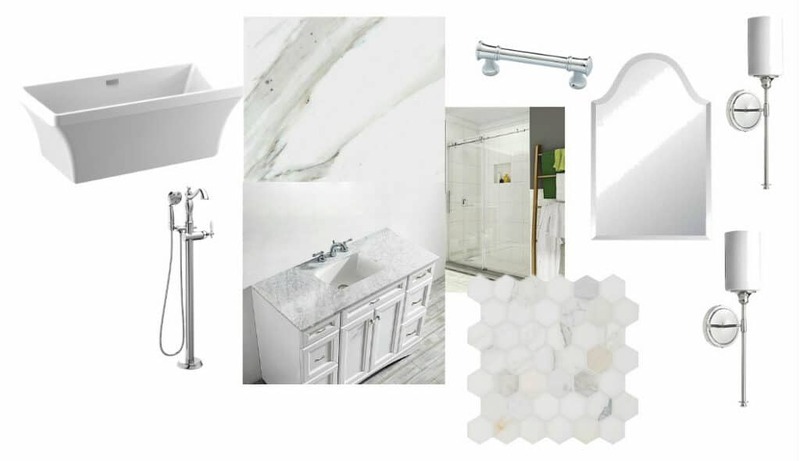 I’m sharing budget bathroom ideas for a luxury hotel look and some tips for cutting cost in your own remodel in part 2 of the bathroom reveal! This post is sponsored by The Home Depot. All thoughts and photography are my own and are not influenced by The Home Depot. Thanks for supporting the brands that support this blog. 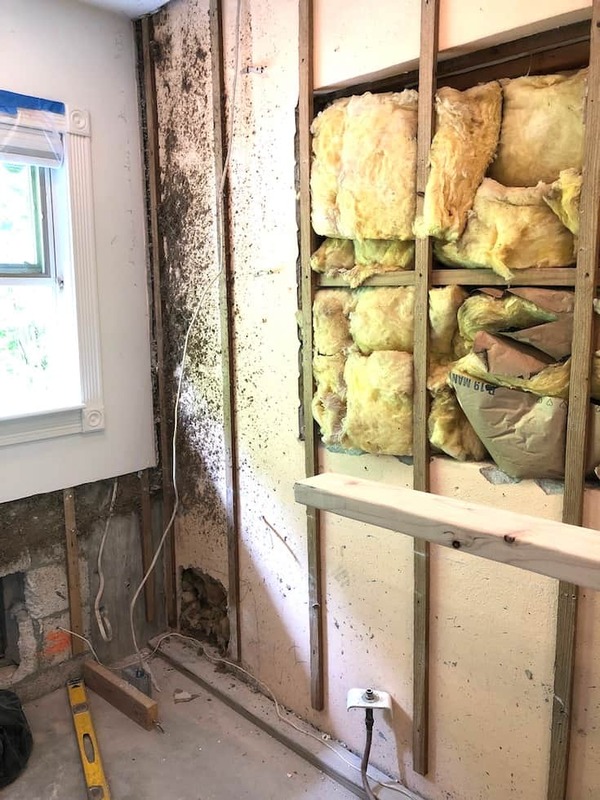 The bathroom in our home was part of an addition that we were able to build after Hurricane Andrew wreaked havoc in 1992. Other than having to replace the tile floors at some point since then due to settling issues, we hadn’t really done much else since then. Raising our family and other priorities just didn’t make it possible and it was finally time to tackle this project! I had been gathering inspiration for several years up until this point, from Pinterest, Instagram and other blogger’s projects. As a visual learner, something else was a catalyst in putting together a sketch in my mind. I have stayed in several upscale hotels over the years both for business and for pleasure. 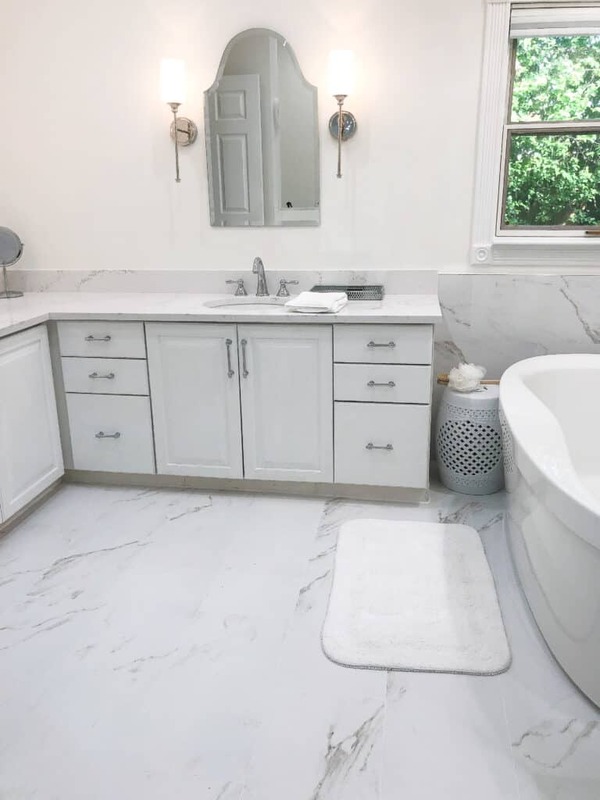 The luxe look of white marble, the sleek and cool feel of porcelain tile underfoot and the upscale look of polished chrome fixtures speak to me. The bathroom in the hotel above was one that I thoroughly enjoyed. I know what I like and it was a budget bathroom with that luxury hotel look and ambiance! All of this being stated, as with any of our home renovations budget has always been a consideration. 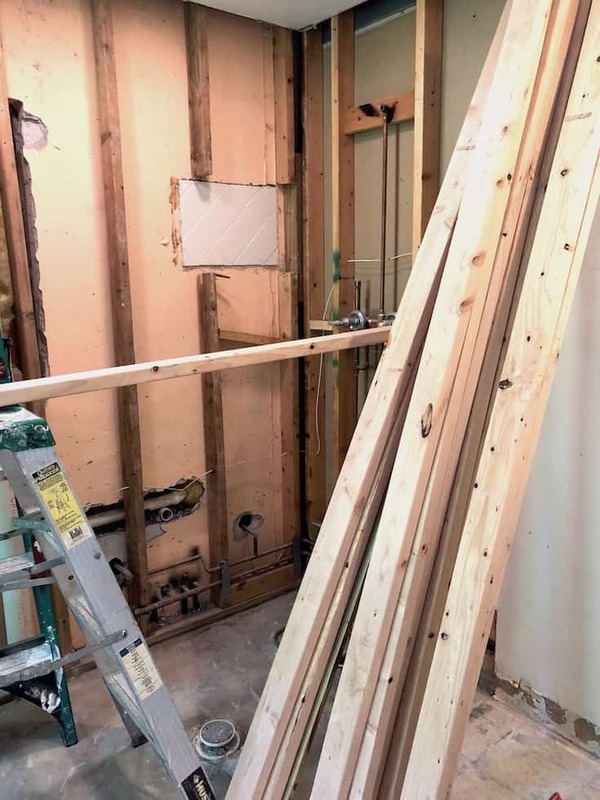 We love home improvements and have worked with The Home Depot on some previous projects, and since my husband is a general contractor he’s in there several times a week. I was able to find exactly what I was looking for by shopping on the website. First came the planning and I created a visual moodboard with some of my ideas. When installing cabinets, simple classic lines never go out of date. White cabinets are my personal choice and can be painted to refresh or change the color. 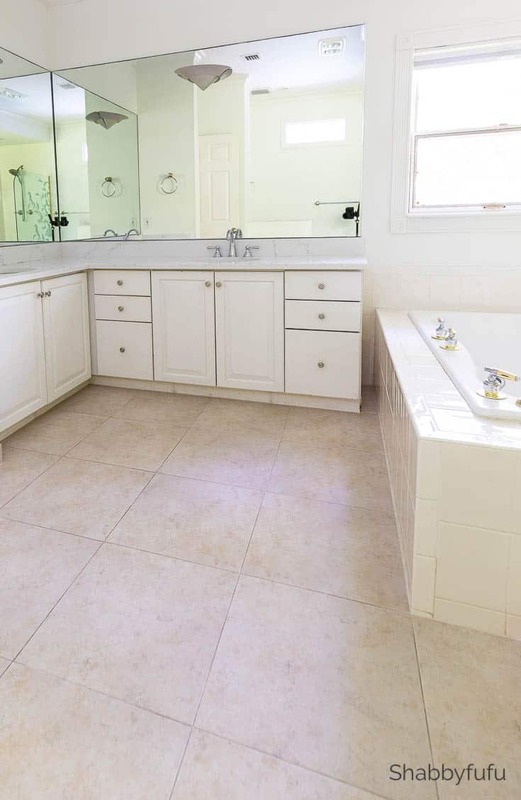 Keep the layout of your bathroom as to the original as possible. Plumbing costs are some of the largest you’ll encounter in a bathroom remodel. With that in mind keep close to the original placement if possible. A bathroom should be well lit and if there is little natural light I recommend using recessed lighting, wall sconces and if it appeals to you…a beautiful chandelier! Now…let’s visit the bathroom before. WHOA! Very beige with undertones of peach on the tiles and lots of huge mirrors on the walls. Besides the obvious 90’s look there was wear and some issues that weren’t perhaps the most practical. The tile was glossy to the point of being slippery, so safety has always been a concern. I never cared for the open shower because of the way that the air conditioning vent would blow cold air directly inside. We decided that the cabinetry would remain and just be repainted and resurfaced (more info on that in another post). As you can see the cabinet doors survived the 90’s and still looked and functioned well. If our budget was unlimited I might have replaced them with two smaller vanities that were taller. Demo of any room in your home is exciting, but can be inconvenient. Luckily we have other bathrooms in our home, so the temporary price of inconvenience was worthwhile indeed! Demo Day…it’s exciting and with so much to tear out it took two days. Plastic sheeting over the cabinets for protection and let the games begin by first removing all of the tile, the tub and toilet. In removing the wall tile there was no choice but to take it down to the studs or it wasn’t going anywhere. We also had to open up the wall in some places to reroute the plumbing for the tub and shower just a bit. 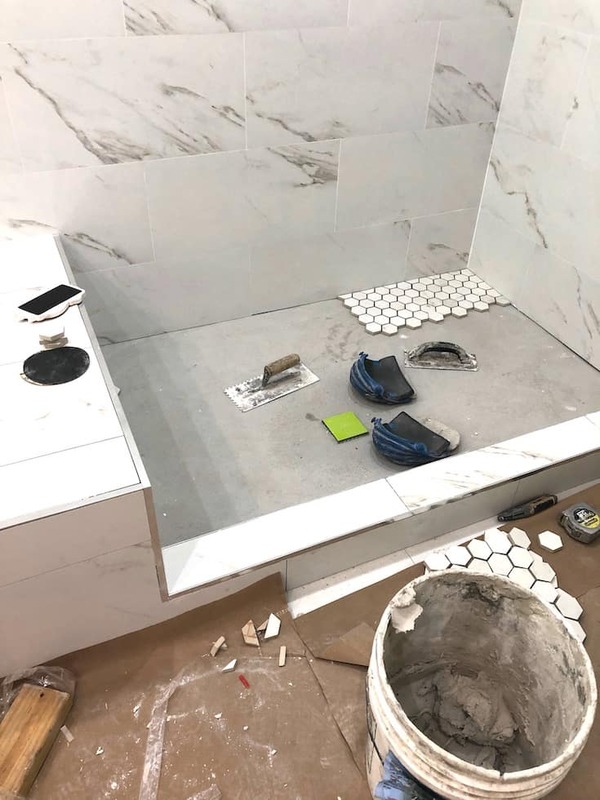 There are a lot of pieces to the puzzle and thankfully with our experience in design and construction we had a handle on how things should be organized. If ever in doubt on a large home renovation project, you’ll save yourself some headaches if you seek a professional designer and/or general contractor. 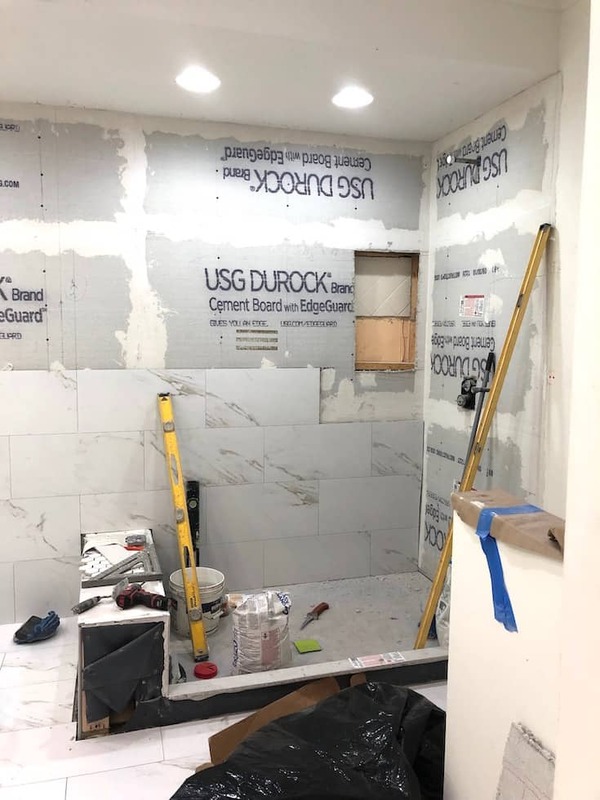 We did not do the demolition ourselves and hired our tile installation team to take care of that. What we did DIY was all of the painting (including the cabinets) and all of the electrical work. After demolition comes the exciting part of seeing it all come together for the budget bathroom luxury hotel look! First comes the cement board and then the tile. One of the elements that I designed into the new space was a shower seat. We didn’t have one in the old shower and shower seats are wonderful for towel storage, plants and leg shaving! A definite MUST was a non slippery surface and I selected the Jeffrey Court Whisper Valley 11 in. x 12.687 in. x 6 mm Porcelain Mosaic Tile for the shower floor. We designed the walls with the tile going all the way up to the ceiling by where the new tub was going to be installed. Since we were going to only have small hanging mirrors, the large format tiles would reflect a lot of light and go with our budget bathroom luxury hotel look. 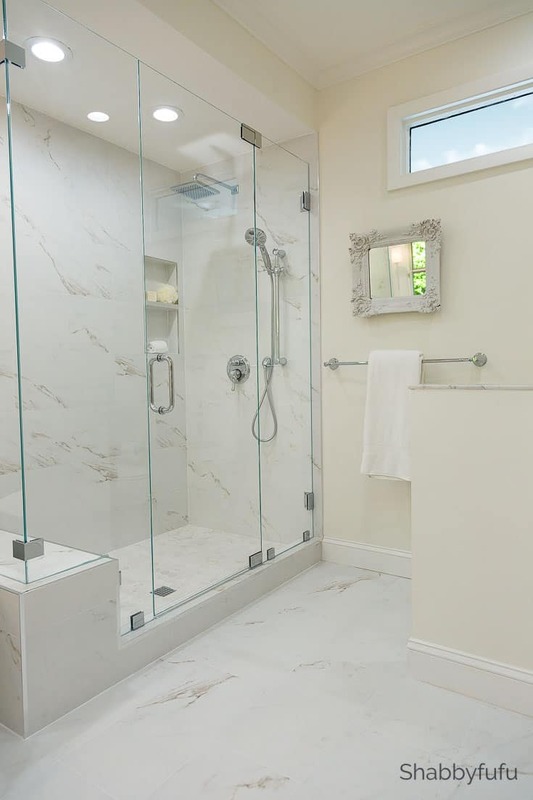 We LOVE the beautiful MARAZZI Developed by Nature Calacatta 12 in. x 24 in. Glazed Porcelain Floor and Wall Tile. It has the look of marble but will not etch and water stain as marble does. We used white sanded grout for the floor and non sanded grout on the walls. I chose this tile specifically for that budget bathroom luxury hotel look and I think we nailed it! 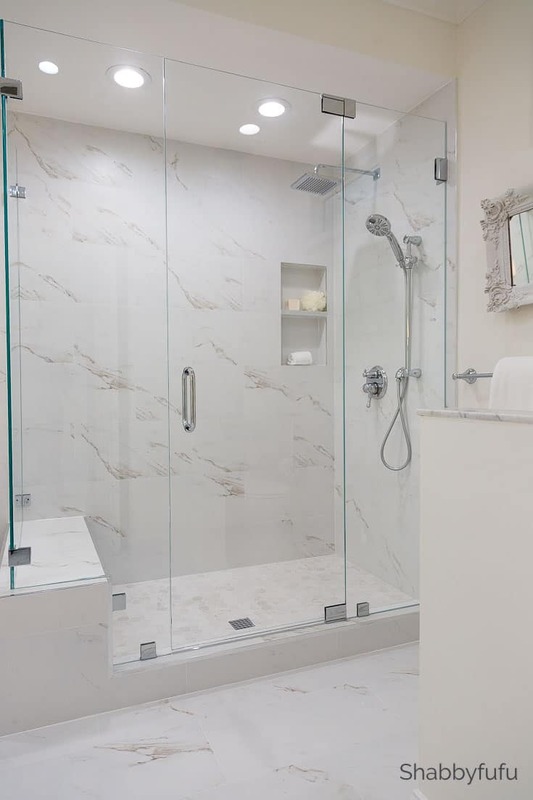 Skipping to the end result here and with the shower, we had the shower door custom made. This was a large expense, and I think that you have to weigh out the value of any home improvement with the value of your home if you go to sell one day. You can’t DIY shower doors and this frameless shower door makes the room shine with that budget bathroom luxury hotel look! Budget was definitely helped by my generous sponsors. By doing as much of the work that we could by ourselves and keeping the vanity cabinets below that helped as well. All of the plumbing fixtures and some of the accessories were provided by Delta Faucet and available at The Home Depot. More about that in THIS POST…the showerhead is a large 8″ square in chrome and you’ll find that HERE. The Delta Faucet Tempo 2O hand shower with wall bar actually tells you the water temperature (amazing!). One great way to update older cabinets (besides paint) is new hardware. You can find lots of hardware to choose from in the LIBERTY CABINET HARDWARE line at The Home Depot. When you don’t see what you’re looking for in your local store, you’ll be surprised at what you can find on The Home Depot website. Thank you to The Home Depot for sponsoring this post. Click HERE to see my bathroom post on The Home Depot blog. I highly recommend the tile! Other sources are listed below. Scroll and click on the photos to shop the look! Some people want this great big giant bathroom but we prefer something smaller and simpler. We just redid both of our bathrooms and love how they turned out. Keep it simple. I love everything about your bathroom remodel. I especially love seeing the before, during and after photos. I always head to my local Home Depot when we’re starting projects on our home and I’ve shopped from their Home Decorators collection for years. I would LOVE to re-do my upstairs bathroom. It’s a very small one (slanted ceiling), but I think I could do so much with the space. ive always prepared smaller bathrooms and bigger closets ha but thats just me – this is truly a great idea esp on a budget too! love all your thoughts friend! I too prefer a small bathroom. Janet, your bathroom turned out beautifully! Exactly my style. Love it! Absolutely stunning work! I love the fresh new look and style for your bathroom. They workmanship is perfection. Thanks for the inspiration. I love all the finishes you chose, especially the white marble. It’s so timeless, you’ll never have to worry about it looking outdated! You are not kidding it looks just like a lux hotel bathroom! Nice work! 5 months ago we just redid our master bath and boy it was a challage and 10x worst.than the kitchen remodel a month befor we ran into so many problems with making our shower bigger .we reused our existing vanity too repainted it and went high end on a barn door custom shower door made our shower double the size with luxury tiles and flooring it really came out nice in the end.. 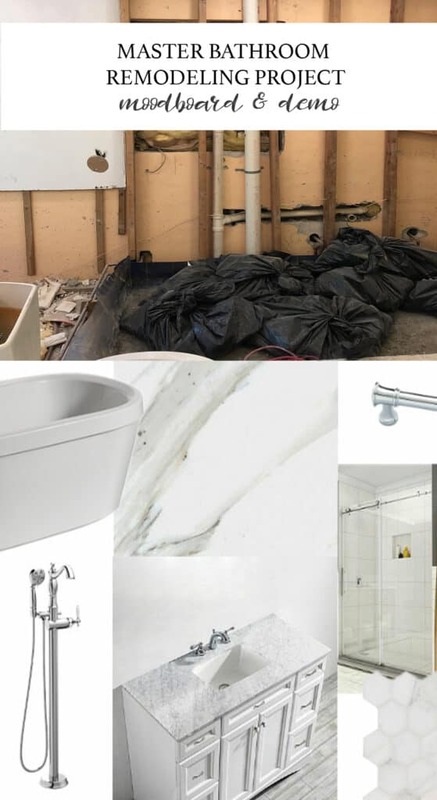 Thanks for your recommendations and ideas they are helping me as we are just starting a bathroom reno after 38 yrs of the same one. Also loving that small white framed mirror by the shower will have to look for one myself. Absolutely gorgeous. I am always impressed when someone goes down to the studs to remodel. That’s such a huge commitment! Love it. Your bathroom looks so amazing! I can’t believe you got it all from Home Depot! I had no idea they carried such great products. 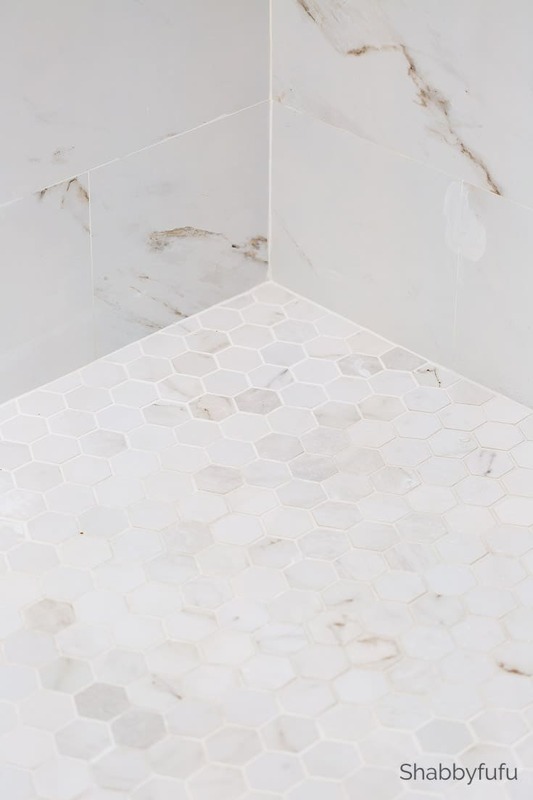 Since you used tile on your floors, do you have any issues like that? It looks lovely, Janet! You definitely achieved what your vision was! You have achieved your goal of that upscale hotel look. Maybe I need to make a reservation next month. It’s just as lovely as your other home projects. Oh my gosh that Bathroom looks gorgeous! I wish I could have a bathroom just like this. It looks like a little spa where you get to spoil yourself every day. I’m hoping one day I can do something like this! What a great transformation Janet. The pink undertones are gone and all I see is a calm relaxing place to go to at the end of the day! Your new shower is really fantastic. Oh wow how gorgeous!! We just did our bathrooms over last year and it was a long process here! You have done an amazing job! I love the transformation of your bathroom. Your color scheme looks so relaxing. Looking forward to doing our bathroom. I’m looking forward to buying our first home this year and being able to create the perfect bathroom! I know exactly what it’s going to look like! This bathroom is gorgeous!! Stylish, bright with plenty of spa vibes. I love the Marazzi tile, Such a beautiful product. Great job with your bathroom remodel. I can’t get over the results of this bathroom. I love the shower. It looks like a great place to relax. Oh wow, it turned out amazing. We just updated our bathroom but, this is gorgeous. 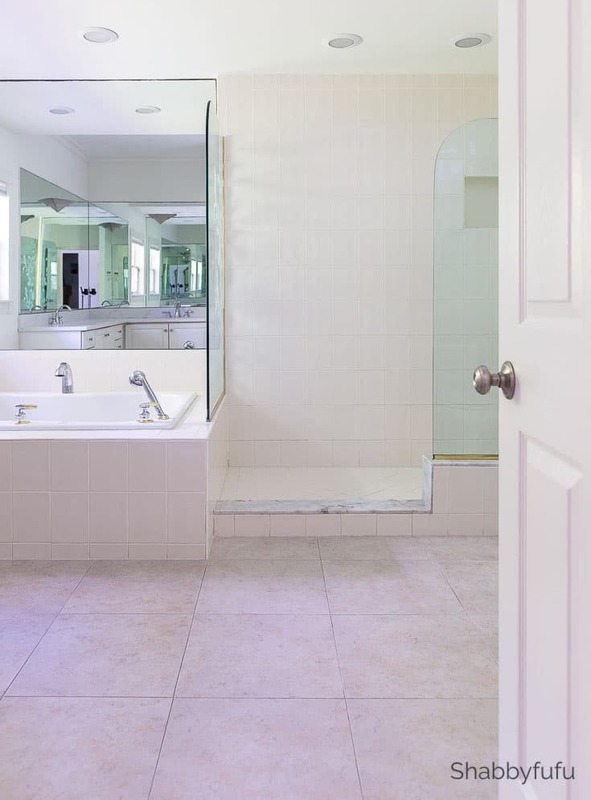 That is my kind of bathroom – light and bright. I love white cabinets and marble countertops or tiles. Your bathroom is absolutely pretty! I love the honeycomb tile on the bottom of the shower. That kind of tile always looks really modern and chic. I love modern, minimalist and clean looking bathroom. Just like the photos above I am getting some ideas to renovate our master bath to make it more like hotel style room. So glad that you found inspiration in the photos then! I’m in love with the look of your bathroom. I Love the look of black and white tiles..so elegant and chic. We love Home Depot too. Home Depot is great…I am in there at least a few times a week! Love your bathroom remodel. It’s such a clean and classic look. Also, you are giving some great advice on how to keep costs down! Plumbing is soooo expensive. Plumbing is always the costliest part of a remodel, so if we can save some that’s surely a good thing! So true…maybe Pin it for later! Thank you for so many good ideas and we have used Home Depot products before on our last home. Good stuff! Well congratulations on your new home Barbara…I can’t wait to see! Wow what a great transformation the marble to ceiling looks perfect. Absolutely perfect! Love all your choices too. What is the name of the Delta sink Faucet? We are starting our lower level and this bathroom design is getting me off to a good start. Thank you for sharing! Thank you Tracey! You can find the faucet set at my link below at Home Depot and it’s so reasonably priced! 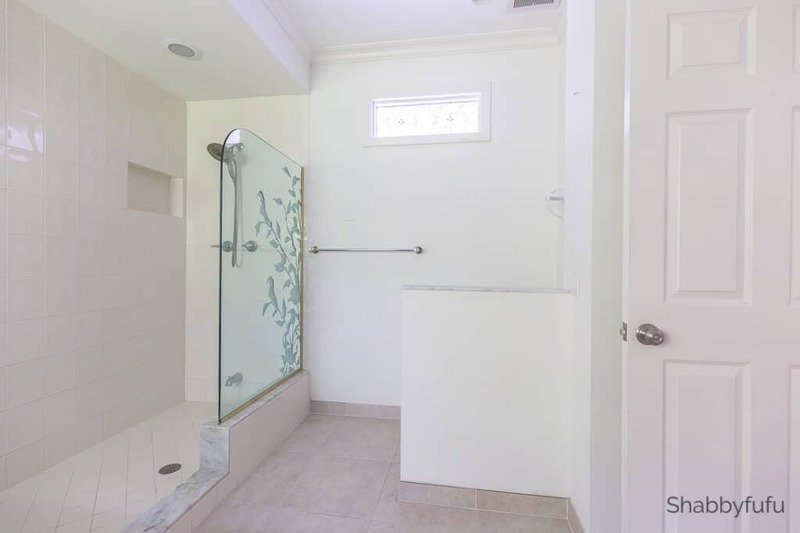 I would like to have seen a photo of the tub area instead of just that peek at the corner. Either I missed it or you left out what you did for the counter tops. I am in the midst of a remodel of our guest bath and used a similar porcelain tile on our floor but at 5x the price. Wished I’d seen this before I bought mine! Darn..could have saved some big bucks. Your bathroom is very pretty. The Home Depot has some amazing deals on tile! I love how this turned out! We are updating our master bathroom as well. I am still in the planning stages but I have saved photos of similar tiles to yours. It’s nice to see how it all looks together. Beautiful job! I’m so glad that you love it and I certainly do too! Those tiles are so beautiful…highly recommend!